The system, specifically designed for Open Skies flights, includes two Tu-214ON planes. Russia plans to enhance the surveillance technology it uses to observe the territory of the U.S. and Canada – but American officials have expressed concern over the plans. U.S. officials want Washington to deny Russia the right to observe strategic infrastructure facilities in the U.S. from the air. Some Congress and Pentagon representatives have voiced concerns over Russia’s plans to upgrade surveillance equipment Moscow relies on in its observation flights over the U.S.
“I cannot see why the United States would allow Russia to fly a surveillance plane with an advanced sensor over the United States to collect intelligence,” The New York Times cited Chairman of the House Armed Services Committee Mac Thornberry as saying. The U.S., Canada, and the majority of European and former Soviet countries, including Russia, have been conducting surveillance flights over each other’s territories for years. Essentially a spying practice, the flights were authorized by the 34 signatories to the Treaty on Open Skies to enhance transparency in the military sphere. Russia recently requested to switch from wet-film cameras to digital sensors for its surveillance flights over the U.S. Although the countries have conducted the flights continuously since 2002, Russia’s steps to improve the technological capabilities of its planes have caused a stir among U.S. officials. “The treaty has become a critical component of Russia’s intelligence collection capability directed at the United States,” Adm. Cecil D. Haney, commander of the United States Strategic Command, wrote in a letter to the head of the House Armed Services subcommittee on strategic forces, Mike Rogers, reported The New York Times. Russian officials confirmed the plans to equip surveillance planes with digital hardware but cited the obsolescence of wet-film equipment as a major reason behind the decision. “We are switching to digital equipment because nearly nobody produces wet-film equipment any longer,’ said Mikhail Ulyanov, director of the Foreign Ministry Department for Non-Proliferation and Arms Control, in an interview to RBTH. The new equipment meets criteria for film resolution set by the Open Skies Treaty, but is less clunky than its predecessor. It also eliminates photochemical processes, allowing an operator onboard to observe terrain in real time, according to Vartan Shakhgedanov, chief design engineer of the new Russian system. 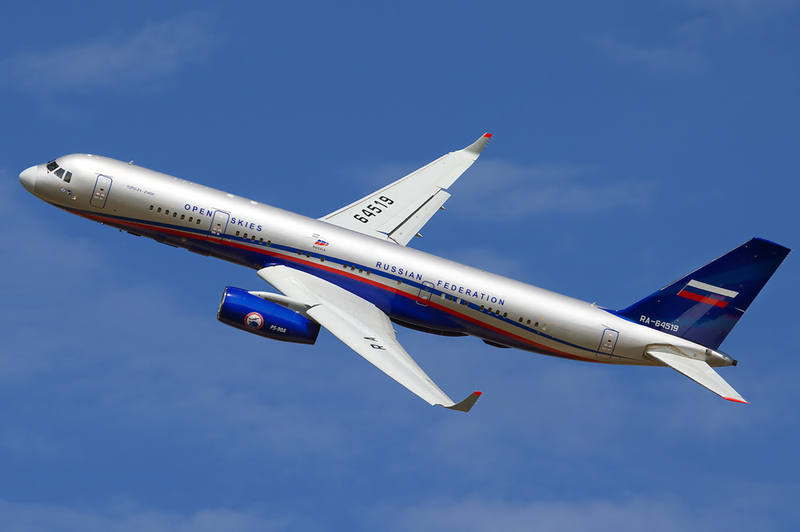 The system, specifically designed for Open Skies flights, includes two Tu-214ON planes produced by the Vega Radio Engineering Corporation (Vega) and the United Instrument Manufacturing Corporation (UIMC), two bodies within the Russian state corporation Rostec. Although the UIMC delivered both planes to the Russian Ministry of Defense in 2013 and 2014, Russia still conducts its surveillance flights over the U.S. and Canada with an old Tu-154M-Lk-1. This aircraft “is equipped with obsolete aerial cameras significantly inferior to those used by the U.S. on its own surveillance planes,” said Shakhgedanov. However, if Russia successfully upgrades its surveillance equipment, the U.S. risks losing its advantage in what has so far been a relatively safe way to obtain strategic intelligence. Yet in spite of its advanced military satellite system, Washington relies heavily on the Open Skies Treaty for Russia-related intelligence gathering. “The U.S. always makes use of all available flights above Russia because the equipment installed on the surveillance planes allows them to observe more things in addition to what their satellites capture,” said Ulyanov. Disagreement over equipment allowed in the Open Skies surveillance flights is nothing new between Moscow and Washington. In September 2013, the U.S. blocked certification of a Russian-designed digital camera that Moscow planned to use in its surveillance flights. Whether the U.S. objections had political rationale or if they were caused by technical issues is not clear. Russia was able to certify the camera some time later. “We solved this issue later. This plane [equipped with the digital camera] is used for flying over short distances in Europe,” said Ulyanov. Russia uses different types of aircraft for its surveillance flights over the U.S. and Canada and over Europe. When Russia conducts flights over Europe, a destination that does not require the planes to remain in the air for long, it uses An-30B surveillance aircraft, which is already equipped with digital cameras similar to those Russia wants to utilize in flights over the U.S. Earlier, all 34 signatory states to the Open Skies Treaty voted in favor of equipping surveillance planes with digital cameras and switching from wet-film equipment, according to Shakhgedanov.